Defender products are rigorously tested in Workplace Access & Safety’s NATA-accredited fall prevention facility. NATA is the authority that provides independent assurance of technical competence through a proven network of best practice industry experts. The criteria for determining a facility’s competence are based on the relevant international standard (e.g. ISO/IEC 17025, ISO 15189, ISO/IEC 17020). NATA provides assessment, accreditation and training services to laboratories and technical facilities throughout Australia and internationally. Defender products and system installation is performed by certified installers, who are trained by experienced height safety experts, Workplace Access & Safety, a Nationally Recognised Training Organisation (Reg. 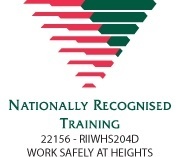 22156) – fully accredited for unit RIIWHS204D: Work Safely at Heights.